Varalakhmi Vratham pooja is a sacred day in Hinduism and on this day pooja is performed by many women of Andhra, Karnataka, Tamilnadu and also in parts of Maharashtra and Orissa. This Hindu festival is celebrated by the name of 'Vara Lakshmi Vrata'. This festival is celebrated on the last Friday of the bright fortnight in the month of Sravana, also called Sawan (in Hindi), which corresponds to the English months of July-August. You can Download songs from the Pdf file. Only a woman can sympathize with women. 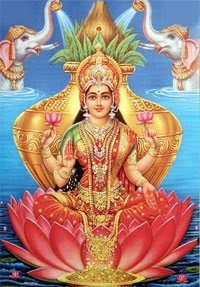 Lakshmi is a woman, so she will more readily sympathize with women. Thus this festival is observed largely by women, invoking the blessings of Lakshmi on them, their husbands and their children. Eight forces or energies are well-known and they are known as Sri (Wealth), Bhu (Earth), Sarasvati (learning), Priti (love), Kirti (Fame), Shanti (Peace), Tushti (Pleasure) and Pushti (Strength). Each one of these forces is called as Lakshmi and all the eight forces are called the Ashta Lakshmis or the eight Lakshmis of the Hindus. Vishnu is also known as Ashta Lakshmi Padhi which is equivalent to saying that he is the asylum for the eight-Lakshmis or forces. In fact, Vishnu representing the preservative aspect of the universe radiates these forces from him. These forces are personified and worshipped as Lakshmis, since abstract force is beyond the comprehension of the ordinary people. As health, wealth and prosperity depend upon the rythmic play of these forces, the worship of Lakshmi is said to be to obtain these three. Parvati and Parameswara were engaged in playing chess and Parvati won the game continuously, but Parameswara is said to have claimed the victory at each games, wantonly, to her intense chagrin. So Parvati wanted to have an umpire and one Chitranemi, a creation of Parameswara, was selected. He sided with him most unjustly as an underling of Parameswara. This provoked Parvati's anger and she cursed Chitranemi that he should become a leper for discharging his duty in most unfair manner. When Chitranemi begged Parvati's pity and Parameswara added his entreaties to it, she is said to have relented and customized the curse by adding that he would be cured of his leprosy by observing the Vara Lakshmi Vrata. It is said that by doing this, Chitranemi was rid of the loathsome disease. The history of the origin of the Vara Lakshmi Vrata is quite fascinating. Lakshmi is said to have visited a virtuous woman by name Sarmadi, living in the city of Kuntinapura in Magadha (Bihar), in one of her dreams and expressed her satisfaction at her devotion to her children. When she woke UP from her sleep, she took a bath and worshipped Lakshmi to ensure her blessings. When the other ladies heard of her dream and her worship of Lakshmi, they started to worship her too, and the custom is then said to have spread universally throughout the land in course of time.